Egyptian mezzo soprano Gala El-Hadidi will give her annual Christmas concert on 16 December at the Cairo Opera House's small hall. "I cordially invite you to my Annual Christmas Concert," she stated urging her fans to "come and enjoy an evening of famous international songs and Christmas Repertoire". "Bring your family, friends and loved ones ...and let’s celebrate this joyful season together," she added. Germany based mezzo soprano visits Egypt frequently performing on a variety of stages. Her Christmas concert is among El-Hadidi's regular commitments to her fans in the country. 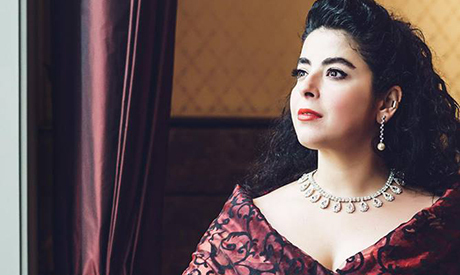 El-Hadidi, the first Egyptian to ever perform Carmen role internationally, made her debut at the age of 17 on the main stage of the Cairo Opera House, a year before signing a contract with the House to become the youngest soloist ever at the company. Gala, who studied with Tenor Sobhi Bidair, Tom Krause in Finland and Marylin Horne in USA, as well as, at the International Bach Academy in Stuttgart, worked with famous conductors including Christian Thielemann, and with Singers: Juan-Diego Florez, Waltraud Meier and Evelyn Herlitzius performing on known stages like Berlin Philharmonic, Stuttgart Liederhalle, Auditorio Nacional di Madrid, Kennedy Center and Cadogan Hall in London.